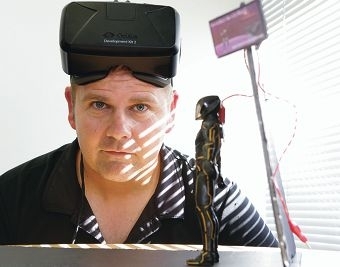 Creating video games since the age of 13, the games development lecturer at Central Tafe will showcase his latest project, Nanotek Gladiators, at the Perth Game Festival on Saturday. Enthusiasts will be able to wear Oculus Rift goggles to go ‘inside’ his sport game where you battle an avatar with what looks like your own arms in a Tron-inspired epic that Hawkins describes as almost like 3D Pong, one of the first video games ever created. The John Curtin College of the Arts graduate released his first game Starfighter as a 19-year-old and sold it in the UK before making it available free of charge on the internet after it was pirated. He has since made another four products, three on his own, including a surfing game called Surfing Prodigy for iPhone, that took him 300 hours to build, and another for Gameboy Advance. Hawkins, who grew up playing Defender, After Burner and Pac-Man at Timezone, graduated from ECU and has worked for Channel 7 and around the world, including in the UK, the Middle East and the US creating graphics, programs and simulators. Festival director Anthony Sweet wants kids, grown-ups and game lovers from all walks of life to be part of the free event. Budding game makers of every age will have the opportunity to speak directly with people in the industry. Plus, there will be talks about what it takes to get both feet in the gaming door, as well as information for parents about gaming. ‘The WA gaming community is recognised around the country, and even internationally, as a really great healthy scene, and I want people to know this,’ Mr Sweet said. The festival features computer games, mobile games, tablet games, console games, arcade games, virtual reality games, board games and even card games.